After a wild open to Fall storm season with flash flooding, vivid lightning, and gusty winds on the evening of the 21st of October, it is time to attempt to answer the question on everyone’s minds: what will this Winter look like? The short answer is bound by two extremes. We will not have a repeat of last year’s sleeping baby season nor will 2014-15’s roaring beast of a Winter make a triumphant return. Minimal analysis is needed to see that, and no two years (or storms) are ever alike. To get any more detailed though, we’re going to need to dig a little deeper. Before we do, however, I would like to offer a word of caution: Seasonal forecasting is a science still in its formative stages. The ideas presented here are merely ideas. There are many folks out there who know way more about this than I do and if you need to make any important decisions based on long range forecasting, you should check with them. Some of them include Michael Clark of BAM Weather, Stephen DiMartino of NYNJPA weather, Ed Vallee of AccuWeather, and of course, the folks at NOAA’s Climate Prediction Centre. With that said, here’s what I think this Winter will look like and why. The main theme of this Winter will be volatility. There are a few factors that argue strongly in favour of cold weather and a couple that favour warm weather. The result is most likely to be deep cold blasts punctuated by short bursts of mild weather. Think of last year except that frequencies of warm and cold periods will be switched. Instead of mostly mild weather with a few cold blasts like last year, signals point to this year being mostly cold with a few mild blasts. This of course is also in contrast to two years ago when there were no mild blasts and supremely cold weather dominated. Storm tracks also appear to be volatile with a mix of clippers, nor’easters and inside runners. This of course contrasts with both last year (only inside runners) and two years ago (only nor’easters/clippers). Now that I’ve gone over the general theme of the Winter, let’s look at some of the ‘why behind the what’. First let’s look at the factors in favour of cold weather. Notice I’m not talking about snowy weather, just cold weather. Of course you can have cold without snow but you can’t have snow without cold so I’ll discuss snow potential in a few paragraphs. The first factor that argues in favour of cold weather is that there is a lot of snow in Siberia currently (see Figure 1, above). When there’s a lot of snow in Siberia in October, cold air in that region gets colder due to the snow and pushes south. That pushes warm air north over the Gulf of Alaska which then pushes cold air south over Eastern North America (us). The black line on Figure 1 represents the rough boundary between warm and cold air. The blue arrows are where expansive snow growth pushes cold air south (causing more snow growth) and the red arrows show where a lack of snow growth lets warm air run north (preventing further snow growth). Also note that this cycle is a feedback loop meaning that the patterns it shows/causes are likely to stick around. The description I gave of this process is, of course, a gross simplification and I point you to the research of Judah Cohen from MIT for analysis that does the process justice. 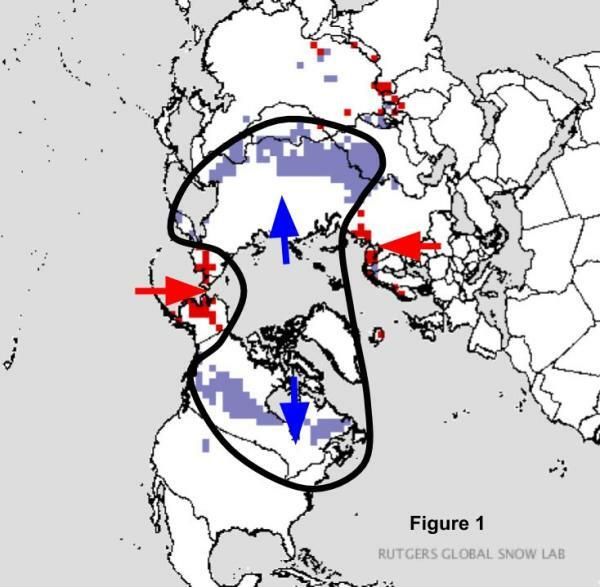 The point is that, in general, strong Eurasian snow growth promotes cold weather here and there is currently strong Eurasian snow growth. Another factor is the current Pacific Decadal Oscillation (note: it was named the Pacific Decadal Oscillation because it was originally thought to move on a decadal (10 year) timescale, however observations indicate it moves in a one to two year timescale, much like ENSO (El Nino/La Nina) phase. The PDO is currently positive as shown by the so called “blob” of warm water just off the Alaskan coast (figure 2, below). This “blob” helps push warm air north in the Gulf of Alaska. As we discussed in the previous paragraph, when warm air goes north over the Gulf of Alaska, cold air comes south over Eastern North America leading to cold weather here in Maine. One thing to note about the current positive PNA pattern is that it is showing signs of weakening. Cold water is moving east from Kamchatka and undermining the blob of warm water. This indicates that the PDO pattern could be trending towards neutral or even negative by the time we reach the tail end of Winter. This could act to bring Spring in on time, compared to the lethargic approach Spring has taken in recent years. Despite what may happen in the springtime, we know that at least through the first half of the winter, the +PDO pattern will be going strong. Now that we’ve established that we’ll have at least some cold air, let’s take a minute to look at the factors that promote some intrusions of warm air from time to time. The first important thing to note is the warm ocean temps just offshore (again in figure 2). With such warm water in the Gulf of Maine, all you need to bring mild air into the region is a quick flip of the wind to east, south east or south. This indicates that there is potential for mild periods here and there — especially along the coastline. The other factor that argues in favour of some warmer temps is the forecast presence of a weak La Niña. La Niña occurs when water off the west coast of South America is cooler than average. Notice that currently, that is the case (figure 2). 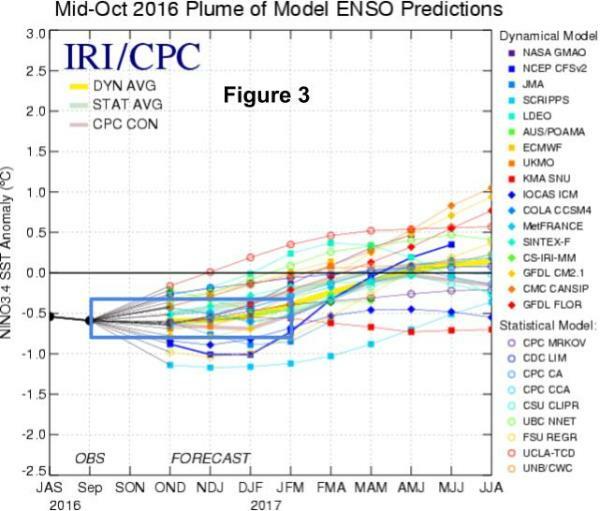 The CPC and climate models (figure 3, next page) continue to forecast the development of weak La Niña conditions for this Winter. going but it’s not the same setup as last year’s El Niño that flooded the entire continent with warmth. Also note the deep cold that usually lurks to the west during weak La Niña events. Proximity to cold air is a dangerous proposition in Maine in a Winter forecast and it wouldn’t take too much to send some of that our way, despite the overall La Niña pattern arguing for warmth. Also remember that in weak ENSO years, ENSO is rarely the driver of the pattern. It is merely an influence; one of many vectors in a pile that must be correctly added up to determine the eventual outcome. As with any ENSO (La Niña/El Niño) event, there are complications. 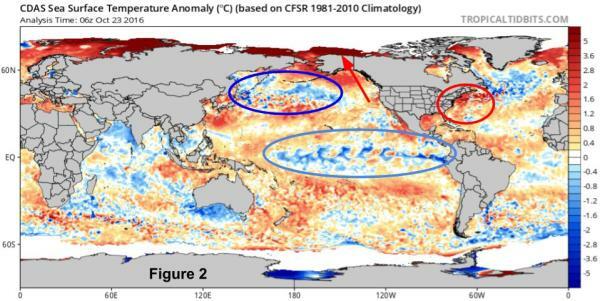 Notice in Figure 2 that there is cooler water on the western edge of the La Niña “bubble”. This indicates a west-based La Niña. A west-based La Niña shuffles up the longitudes which thunderstorms form at or near the equator. This impacts the MJO (Madden-Julian Oscillation, an eastward propagating disturbance that enhances tropical convection) phase which has been shown to impact our weather. A west-based La Niña predisposes the MJO phase to be favourable for cold weather in Eastern North America, however that’s not a rock solid connection. The MJO often has a mind of its own and could also be negated by other factors we’ve talked about. 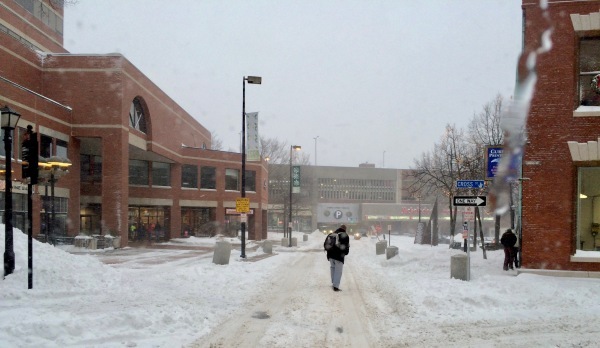 For more on that, check out Stephen DiMartino’s Winter forecast from NYNJPA weather. Will this year feature the same slow start we’ve seen the past couple years? The answer is a bit complicated as two important factors are giving conflicting signals. 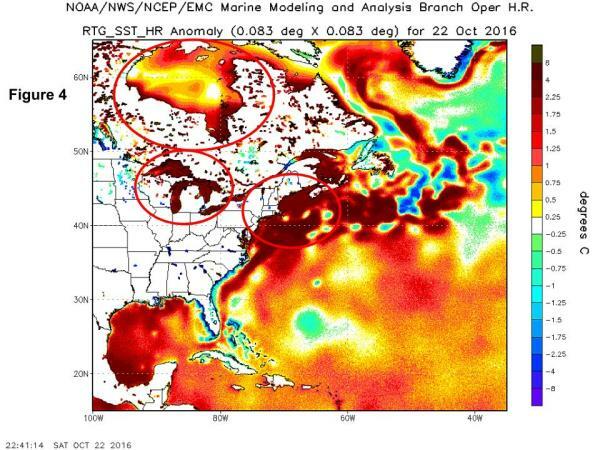 One important thing to look for is how warm (or not warm) the waters of the Gulf of Maine, the Great Lakes and Hudson Bay are. If the waters are warm in the Great Lakes and Hudson Bay, cold air masses moving in from the North-West will have a hard time staying cold as they move over warm water. We’ve already gone over the impacts of warm Gulf of Maine waters, so if you missed that, look up a few paragraphs. The water this year in all three locations is quite warm (see figure 4, below). Hudson Bay is only moderately above normal but the Great Lakes and the Gulf of Maine are downright balmy compared to average. This means that as cold air masses move south, they will modify (become less cold) as they pass over the waters. This would argue for another slow start, but as with anything in weather, it’s never that simple. The other important factor in the early season behaviour is Canadian snow growth. If there’s snow just to our north in Canada, cold air masses can become colder and stay colder for longer as they travel south. A check of figure 1 reveals robust Canadian snow growth, which would tend to support very cold air masses spilling south. Soooo, given all that what do I think will happen? Currently we’re seeing cold air masses spilling south and being significantly modified by the time they get here (if they get here at all). By December, I think the air masses will have become cold enough to bring the water temps down to a point where they will have negligible influence over the incoming cold. That means I think we’ll start slow, but not nearly as slow as last year. How about storms/snow? There are a few clues to storm track/characteristics and snow but it is important to remember there’s just simply no way for us to tell exactly where a storm will go — even a couple days before it hits. The storm tracks I describe on the next page are generalisations. For example, I think we see at least a few intense nor’easters, but will these track inside the benchmark and bring us rain? Possibly. Will they track just offshore and bring us heavy snow? Possibly. Will they track farther offshore and miss us altogether? Also possibly. The point is to outline a general pattern, not to throw darts at a board for specifics. With that said, let’s look at some of the clues, so turn the page and stay with me... this is too exciting to stop now! The warm sea surface temperatures (SST’s) off the East Coast go both ways for cold and snow here in Maine. First, they argue for intrusions of warm air: not good for snow. However, they also provide intense fuel for powerful storms. Energy in meteorology comes almost exclusively from gradients or differences. The greater the difference between characteristics at two places and the closer those two places are, the more energy there is for storms to develop. You see this in thunderstorms, for example. The greater the difference in temperature between the surface and aloft (lapse rate) the more energy there is for a storm to develop. In the case of Winter storms, the greater the temperature between the ocean water and the cold air mass moving over it, the more energy there is for coastal storms to develop. Figure 2 shows us that there is PLENTY of hot water off the coast to fuel developing storms. This means there is increased potential for nor’easters and redeveloping clippers. That doesn’t mean we’re in for the powderfest known as 2014-15, though. Notice the warm waters in the Gulf of Mexico and just off the Southeast coast. These waters could act to help prolong a current phenomenon known as the South East Ridge which is an area of high pressure that stretches across the SE U.S. and northeast into the Atlantic. This ridge, combined with warm SST’s up and down the coast are likely to force at least a few storms west of the area, following tracks we saw last year. I do not think these will be nearly as frequent or dominant as last year but I also think they will bring us some of the warm periods the winter of 2014-15 was missing. — A slow-ish start but not as slow as last year. No December snow blitz but no shorts like last Christmas Eve, either. — Alternating periods of fairly intense warm/cold. Slightly more cold than warm. — An on-time arrival of Spring. No dragging out of Winter like the past few. — An active but variable storm track. Mix of clippers/cutters/coastals, but none dominate. — A weak, west-based La Nina. — A +PDO moving towards neutral and eventually perhaps weakly negative. — Robust Siberian and Canadian snow growth. So, we’ll see how it goes! Meanwhile, enjoy the last vestiges of Fall and I’ll be back next month with more weather. ​Every month I define a couple terms that will help you increase your knowledge of the weather jargon you will see in both my forecast discussions and in those of others. Here are this month’s terms. If you have further questions or have a weather term you would like explained, shoot me an email at jack.sillin@gmail.com or send me a note on twitter @JackSillin. You can also drop a comment on my blog at forecasterjack.com. The Benchmark — I used this term in this month’s column and roughly speaking it’s an imaginary spot formally called the 40/70 benchmark — 40 degrees north latitude and 70 degrees west longitude. It’s importance is helping meteorologists determine what effect a storm along the East Coast might have on New England, including Maine. If a storm passes too far west, we most often get cold rain. Too far east and clouds, but little or no snow. If a storm passes right over the benchmark it’s time for the shovels. 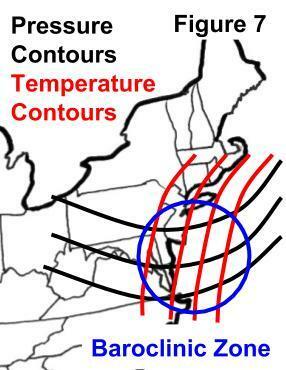 Baroclinic Zone — A Baroclinic Zone is an area where temperature changes rapidly along lines of equal pressure. Check out the chart below for an idealised representation of what this looks like. When this setup occurs, there is lots of potential energy stored up in the atmosphere that can be ignited by an upper level disturbance passing through. Baroclinic zones are strongest when the difference in temperature is greatest along the same pressure contour and across the same distance. The Eastern U.S. is a natural baroclinic zone because air just offshore is warm due to the Gulf Stream while air over the continent can get really cold should an arctic air mass spread south. When the edge of an arctic airmass sits along the East Coast, storms are more likely to form and develop rapidly due to all the available energy from the baroclinic zone. Here are the captions for the figures. Figure numbers indicated on the graphic.